I had to post today to acknowledge the reaction to my last update - it clearly struck a chord as I had numerous direct messages and emails after publishing it. I'm so glad that many of you started thinking about the question I posed, and hope that you gained insight and encouragement from your findings. After posting, I decided to start doing some of the things that I was dragging my feet about. I registered a second Instagram account and an online journal/blog and signed up for an online course. 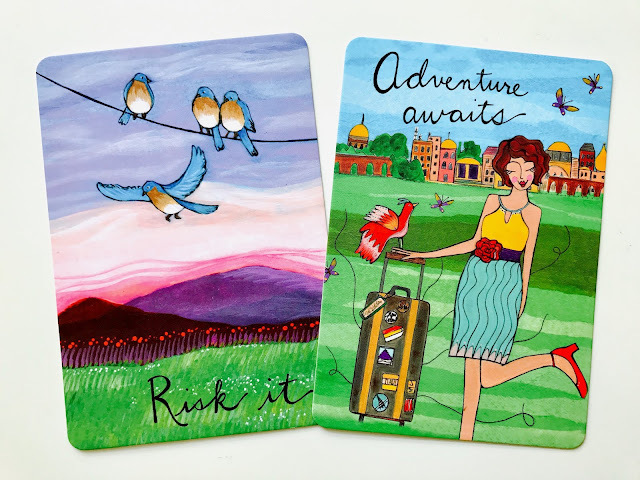 It's absolutely nothing to do with knitting or crafting, but if you're interested in increased self-awareness and using tarot or oracle cards (similar to those pictured above) as a tool for personal development, then you might want to take a look. Here's an extract from the 'About' page. "I don't believe tarot or oracle cards are magical or that special powers are needed to read them. Anyone can do it. You simply need a willingness to inquire and to listen to your intuition - this is the thing that helps link your conscious thinking with your unconscious mind - it's the niggle that tells you whether or not you're on the right track. Essentially the cards are a way of shining a light onto the parts of us that we might not usually think to look for, similar to hypnotherapy." I've been thinking of writing about these things for a little while but didn't have an outlet, so it feels good - something fresh and exciting. I always do enjoy the 'casting on' aspect of a new project. Speaking of which, I also started a little crochet project - I even finished the crocheting, but still need to find the right buttons to finish it off properly. I'll save it until then to show you, but here's a sneak peek (predictably, it's grey!). I have a lovely cake of the new Scheepjes Whirl in Green Tea Tipple* (grey and TEAL!) but I'm not sure what to do with it yet - it's a whopping KILOMETRE of yarn. There are so many options, and I'm thinking it might become a crochet wrap or shawl but the exact shape and style is eluding me for the moment. We are going on holiday over Easter so something easy which will make a good travel project is the most likely. One cake will certainly be enough to keep me occupied while travelling and relaxing with the family. Finally, I have a few things to review, including a new magazine and a portable desk system, so stay tuned for those. In fact, I'd better get to it! *Wool Warehouse affiliate link. The yarn is now widely available to order from Scheepjes stockists. I used to use Tarot cards...I had a set of Goddess cards and they're still around here somewhere. I was doing lots of soul searching many moons ago and evidently I found myself because I am happy as a lark now a days and no longer feel the need. But at 68 years old you would hope I would know myself before it's too late! LOL! I think that whatever tools out there help you to become and live a more authentic life is a good thing. Remember...(I don't know who said this but it's great)....you need to be yourself because everyone else is taken! LOL! Have a great day!